As you might expect of a city that has entertained more than its fair share of princesses and film-stars, Rome has a large number of five-star luxury hotels. Modern travellers, though, should do a spot of research before booking a hotel in Rome based on its star-rating. 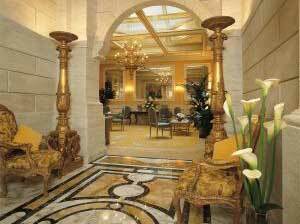 Some of Rome's top-end hotels have surprisingly bad reviews from recent guests, and the establishments can be stuffy and lacking in the five-star service and facilities expected by an international guest. Some of the best Rome five-stars are listed on this page, along with a couple of four-star hotels which surpass many five-stars in their charm and style. In fact, if you are looking for a special atmosphere and excellent customer service, it is worth considering a classy hotel with fewer stars. Our hip hotels page offers suggestions for smaller hotels, luxury suites and and very special B&Bs. 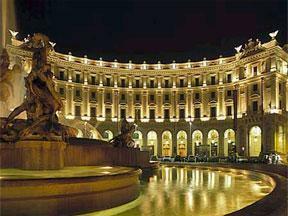 There are several points to be aware of when booking a five-star hotel in Rome. Travellers may be surprised to learn that in the more expensive Italian hotels breakfast often costs extra (this is stated on the booking pages). It's rarely worth paying for - you can save money by eating at a local cafe instead. Internet access can also cost extra in an expensive hotel (although in cheaper hotels it is frequently provided free of charge). Room-service, when available, is likely to be poor and prohibitively expensive. With a few exceptions, hotel restaurants are inexistent or not to be recommended. 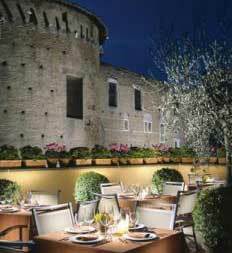 In Italy the norm is to find a good local restaurant for evening meals. Note that a historic building in the heart of an ancient city does not lend itself to facilities like swimming pools; a hotel outside the town centre is better if you are looking for sports facilities, green space or car parking. A grande dame of luxury Rome hotels, the Grand Hotel de la Minerve is in a lovely location alongside the Pantheon - midway between the attractions of the Centro Storico and the shopping streets around the Spanish Steps. It has a pretty rooftop terrace and a gym. 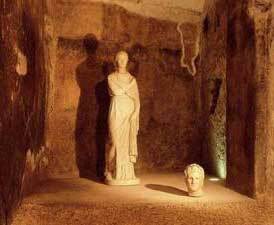 Just yards from the Colosseum, this is perhaps the best-located five-star for tourists. Note that guest reviews are mixed (read the latest comments before booking), with negative comments from those who've booked the hotel's 'loft apartments' some distance away. Sophisticated modern travellers will not be too impressived by the hotel's very 'Italian' publicity photos of scantily-clad ladies in suggestive poses. 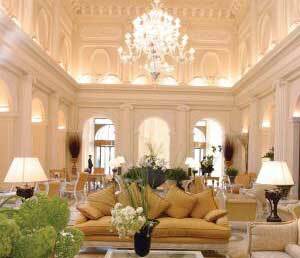 A five-star hotel which is highly-rated by past guests, the Splendide Royal is old-fashioned and reasonably grand. It offers a gym and an expensive restaurant with panoramic views. 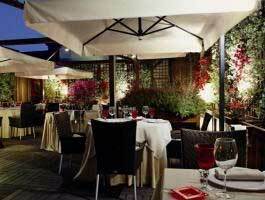 The location, by the Villa Borghese park, is fairly convenient. Most of Rome's five-stars cluster in the areas around Villa Borghese. Hotel St. George, though, is right in the heart of the historic centre, in a far more charming location. The hotel has 64 rooms, a spa centre and a pretty terrace. The style is modern and attractive, in a historic building. A new favourite, the Exedra dominates one side of Piazza della Repubblica. The carpeted pavement outside and waiting limousines shriek luxury, but the smart pavement bar tables under the portico integrate the hotel well with the city surroundings. The hotel is a pretty good balance of stylish modernity and old-style luxury - at a price. 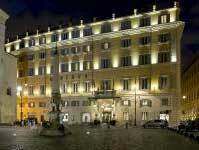 If you like the sound of this hotel, try visiting our hip hotels in Rome page.